I really don't usually like books that are a series. There's a couple reasons for this. I'm kind of a commitment phob about even starting a book in a series. What if I don't like it? What if I do and then can't find the rest of the books? I hate having to buy books at full price and most of the books I own came from library book sales, Bookmooch, or were gifts. I know that I can pretty much interlibrary loan anything my heart desires but I'm still weird about reading series. Every now and then though, I make an exception. 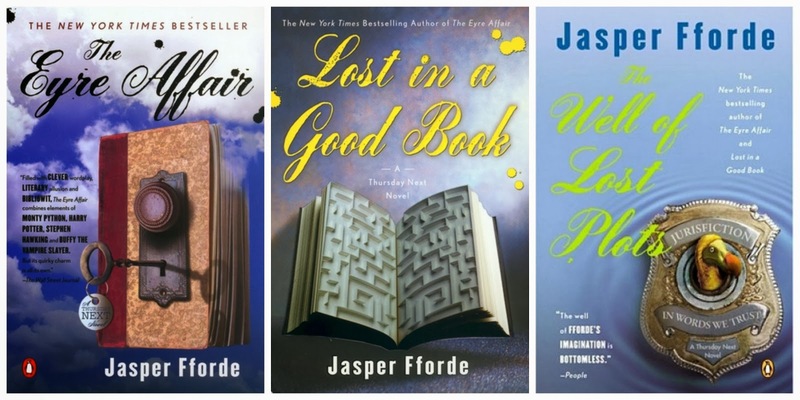 One of those exceptions is Jasper Fforde. I'm actually reading two of his series right now. There's the "Nursery Crime" series, which entail the adventures of police detective Jack Spratt and his partner Mary Mary. But the series I prefer is the "Thursday Next" series. There's currently eight books in the series. I've read the first three, "The Eyre Affair", "Lost in a Good Book" and "The Well of Lost Plots". 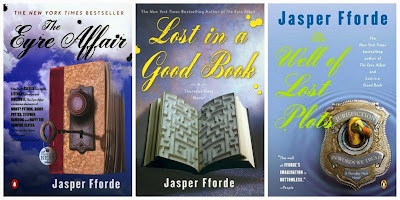 Jasper Fforde is English and he doesn't seem to be super popular in The States. I'm not sure why more people haven't read his stuff, because he has this awesome British humor that just makes you laugh out loud. Thursday Next is the main character of the series and she lives in a sort of parallel England to ours. She is a literary detective with a pet Dodo and a crazy family. She gets her big break investigating the kidnapping of Jane Eyre from the book of the same name. After inadvertently altering the ending of Jane Eyre (with some loving it, and purists hating it) she becomes an apprentice to Miss Havisham from "Great Expectations" and joins Jurisfiction (the police force inside books). 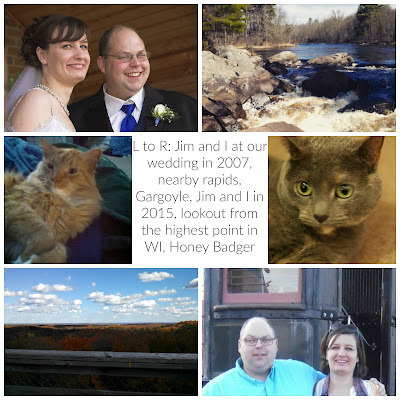 She faces trials (both literal and figurative ones) and meets all sorts of literary characters along the way. I think I've mentioned before that I have a soft spot for fantasy in my novels and these books definitely have it. The more familiar you are with the classics, the more the "inside" jokes will make sense. If you like mysteries with a touch of humor and smidge of famous literature characters, you should really give the Thursday Next series a try. They're light and funny, but still hold your attention and make great fall reading.